The city is the home of prosperity. It is the place where human beings find satisfaction of basic needs and access to essential public goods. The city is also where ambitions, aspirations and other material and immaterial aspects of life are realized, providing contentment and happiness. It is a locus at which the prospects of prosperity and individual and collective well-being can be increased. However, when prosperity is restricted to some groups, when it is used to pursue specific interests, or when it is a justification for financial gains for the few to the detriment of the majority, the city becomes the arena where the right to shared prosperity is claimed and fought for. As people in the latter part of 2011 gathered in Cairo’s Tahrir Square, in Madrid’s Puerta del Sol, in front of London’s St Paul’s cathedral, or in New York’s Zuccotti Park, they were not only demanding more equality and inclusion; they were also expressing the need for prosperity to be shared across all segments of society. 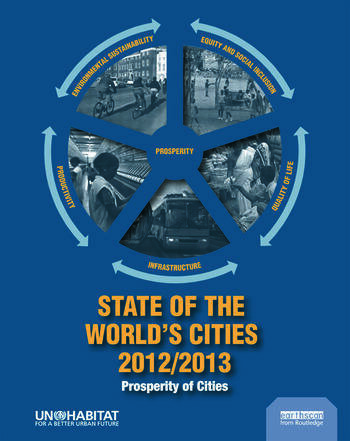 What this new edition of State of the World’s Cities shows is that prosperity for all has been compromised by a narrow focus on economic growth. UN-Habitat suggests a fresh approach to prosperity beyond the solely economic emphasis, including other vital dimensions such as quality of life, adequate infrastructures, equity and environmental sustainability. The Report proposes a new tool – the City Prosperity Index – together with a conceptual matrix, the Wheel of Prosperity, both of which are meant to assist decision makers to design clear policy interventions. The Report advocates for the need of cities to enhance the public realm, expand public goods and consolidate rights to the 'commons' for all as a way to expand prosperity. This comes in response to the observed trend of enclosing or restricting these goods and commons in enclaves of prosperity, or depleting them through unsustainable use. The Report maps out major policy steps to promote a new type of city – the city of the twenty-first century – that is a 'good', people-centred city. One that is capable of integrating the tangible and more intangible aspects of prosperity, and in the process shedding off the inefficient, unsustainable forms and functionalities of the city of the previous century. By doing this, UN-Habitat plays a pivotal role in ensuring that urban planning, legal, regulatory and institutional frameworks become instruments of prosperity and well-being.